What makes a great hotel? Is it the comfort of the beds, the beauty of the surroundings, or the attentiveness of the staff? Does the restaurant experience factor in? We think the answer is “All of the above and more.” Today, Gildshire Magazines turns its discerning travel eye on the best hotels to be found in the United States. These hotels are destinations all by themselves, therefore sought out whether they’re surrounded by an ocean beach or a desolate moonscape. Lauded by Trip Advisor, Forbes, and Conde’ Nast, the hotels we are about to introduce are our recommendations for your very next trip? Are you packed? Great, then let’s go! The best hotel of your life is in the next few paragraphs, and we can’t wait to show you. The best hotel in New England. Northeast Region: Inn By the Sea, Cape Elizabeth, Maine. “Snuggle” is the operative word in Maine, nine months a year. This 4-star hotel is snuggled on Crescent Beach, located near Casco Bay. The hotel offers outdoor patios and decks, along with large living spaces, hardwood floors, and gas burning fireplaces. Here you’ll find oversized baths including dual vanities, soak tubs and showers. *Gildshire Travelers Recommendation* Choose a beach suite for the water views. Reserve your room via the hotel website, or by calling 207-779-3134. Mid-Atlantic Region: Ocean House, Westerly, Rhode Island. We have long declared that Rhode Island is an underappreciated state, and never more than when it comes to vacationing. Heck, the beaches alone are worth the trip and the performing arts scene is second to none outside Broadway itself! So now, we get to cap off our love affair with Rhode Island at this delightful hotel. Nominated as one of only eight Forbes triple 5-star hotels in the world, this place offers its guests a once in a lifetime vacationers experience. How once in a lifetime, you ask? We’ll let you know when we get back from a spin in one of four Mercedes convertibles, available to guests. We’ll give you a minute, just to close your mouth. 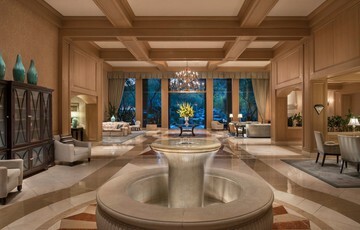 *Gildshire Travelers Recommendation* The spacious guestrooms are great, but the specialty suites are fabulous. Reservations on the hotel website, or by calling 855-678-0364. Greenery abounds at our choice for the best hotel in the southeast. Southeastern Region: Lookout Point Lakeside Inn, Hot Springs, Arkansas. Speaking of underrated, Hot Springs, Arkansas is NOT by savvy travelers. Between the green hills, the blue water, and the hot springs themselves, this is one of the best places to vacation in the southeast. Lookout Point Lakeside Inn is the perfect launch point for your Hot Springs adventures. This hotel is actually a B and B, and only you get to decide which “B” is the better “B.” That is correct, the food is that highly-rated. All accommodations feature breathtaking views of Arkansas’ Lake Hamilton. The hotel’s gardens are special, and the beds are dressed in fine linens. *Gildshire Travelers Tip* Ask for a room with a whirlpool tub, because you deserve it. Reservations on the hotel website, or by calling 501-525-6155. Big Cedar Lodge’s view from its magnificent dining room. Midwest Region: Big Cedar Lodge, Ridgedale, Missouri. When one thinks of environmentally sound practices and oneness with nature, Missouri may not be the first place that comes to mind. Think again, when it comes to this hotel. Big Cedar Lodge takes pride in how it honors the magnificence of nature. The staff and management are all about preserving the wilderness in which their stunning hotel sits. Lodges, cottages, and cabins are all available, and all include plush bedding and well-appointed accommodations and amenities. *Gildshire Travelers Tip* Choose a log cabin for your night’s rest, as they are built from rough-hewn wood and smell great! Reservations on the hotel website, or call 800-225-6343. West Region: San Ysidro Ranch, Santa Barbara, California. Forty-one individually crafted and decorated suites wind along San Ysidro’s creekside tree-lined paths. They are in harmony with their surroundings while enhancing them, at the same time. That’s Santa Barbara magic at work, toward casting its spell on the best hotel in California. What’s so great about this place? We’ll be glad to show you over a glass of White Zinfandel and in front of the Old World masonry fireplace. Or maybe you will know for yourself, right after relaxing in the hot tub. If all else fails the glazed maple leaf duck breast from the Stonehouse Restaurant will do the job! That’s right, it is all here and within earshot of the Pacific surf. *Gildshire Travelers Tip* Choose an ocean view hideaway, as we like them better than the cottages. Reservations on the hotel website, or call 805-565-1700. Allow us to hazard a guess since we know you as we do. If you weren’t packed before we spoke to you today, then you are packed now! Well, you should be, because these hotels are memories in the making. Have a great time, we can’t wait to see the pictures. You’ll look great in them.